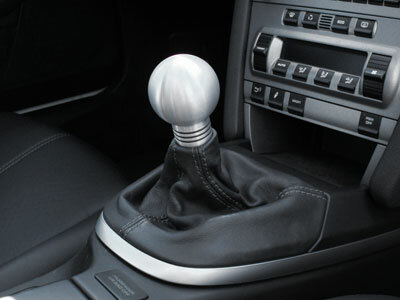 Ball bearing short shifter ! I will send everyone a PM to confirm and get the infos needed ! If you want one, I can make as many as I want. and yes I know ^this^ is not a boxster. I did find some replacement boots on ebay for pretty cheap. It was very tight on the square edge where it is stitched up to fit the straight edge, and I tore a small hole on the edge trying to get it to fit on. What was nice is that it had slits cut to wrap around the pieces that protrude from the plastic clip. I emailed the seller and they said to soak the leather piece in hot water first for a few hours and then install it. I soaked it for about 10-15 minutes and then installed it went and it went on. I probably will just keep it as the tear is not very noticeable. The stitching was so-so, the one you posted looks much nicer. If I decide to replace mine I will take the old one off and use it as a pattern and just make a new one out of a piece of leather jacket I got from goodwill that I was saving to make a new tool roll and then I can stitch it in gray to match the rest of the leather stitching. Please, those who haven't answer to my PM, I need your infos as soon as possible ! Which seems like it's better quality. Let me know how your custom one turns out and if I buy this one I will post a review. Are you still adding customers? I just had Ben's ball bearing short shifter installed. The quality is excellent and I love the new feel. Highly recommended! Thanks for the feed back ! Great! Look at the gated shifter on an Audi R8. They are beautiful. I got to work on one a bit a couple of weeks ago and the shifter looks and works great. If you are going to anything as a model, that would be it. But first I have to finish my two projects (shifters and intake plenum), I don't want to have too much things going on at the same time !